Five-pound cupro-nickel Brilliant Uncirculated coin. The Royal Mint has released (22nd February) their latest coin design which is part of the immensely successful and popular series entitled “Queen’s Beasts.” The coins from the Queen’s Beasts collection, which are inspired by ancient symbols of power and identity, bring to life the 10 imposing statues that are part of an enduring legacy defining Britain’s ruling dynasties. The newest beast to join the 10-coin series is the Yale of Beaufort, a mythical beast described being the size of a hippopotamus with the tail of an elephant, the jaws of a boar, and of a black or tawny colour with the ability to swivel each of its horns independently to use as a prominent weapon. Descended to the Queen through King Henry VII (reigned 1485–1509), he inherited the heraldic beast from his mother, Lady Margaret Beaufort, who herself had played a role in the Wars of the Roses. Her position as matriarch of the Tudor dynasty gave the Yale prestige and symbolic meaning. One of the more obtuse and mythical creatures of the Queen’s Beasts, it nevertheless has an influence which has been carried through to the modern day. Two-pound silver Proof coin. Hover to zoom. 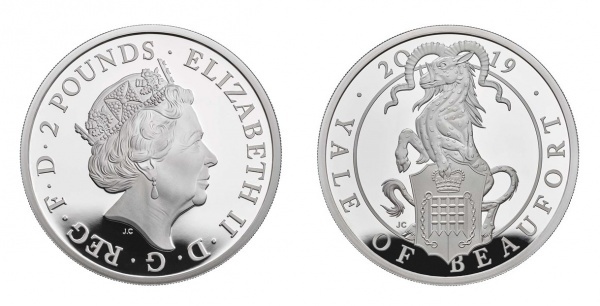 The reverse design is created by Jody Clark, the Royal Mint engraver who has chosen to depict the Yale of Beaufort, focusing on its horns as a focal point in the design and maintaining some of its mystery and ancient heritage. He is seen standing on his hind legs, while keeping a defensive stance in support of the Tudor shield consisting of the crowned Portcullis gates. 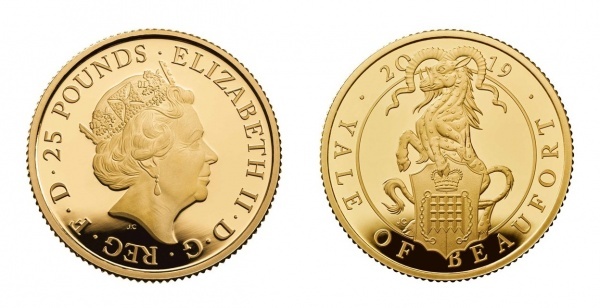 The inscription YALE OF BEAUFORT is placed below the primary design and the year of issue, 2019, is shown in two digits separated by the head of the Yale. 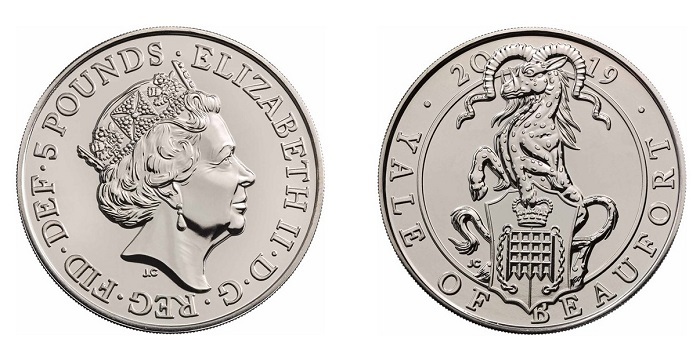 The obverse bears the fifth effigy of HM Queen Elizabeth II, also designed by Jody Clark, and was introduced onto British coinage in March of 2015. Each Proof coin in the series is available as a separate purchase and is presented in a custom case accompanied by a numbered certificate of authenticity and booklet describing the overall series of 10 Queen’s Beasts. For additional information about these coins and others available from the Royal Mint, please visit their website. The inspiration for the design of this series has been taken from the actual Queen’s Beasts sculptures, each standing at around two meters tall, that were created by James Woodford for the coronation ceremony of Queen Elizabeth II held in Westminster Abbey in 1953. Stone copies of these figures can still be seen at Kew Gardens, outside the palm house.